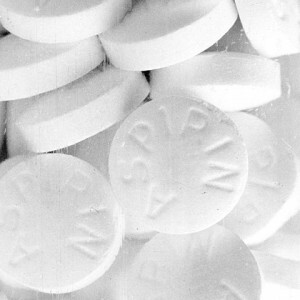 “I think aspirin is the best anticancer drug today. I think everyone over 50 should take aspirin. It’s the cheapest thing on the planet and very effective… I take one pill of 25 mg a day.” So said Professor Mel Greaves of the Institute of Cancer Research in London at a recent conference where he was presenting a paper on the complexities of cancer. There is research in animals and people suggesting that long-term consumption of aspirin can reduce the risk of developing various cancers, or of certain cancers coming back. Whether or not it should be taken routinely as a prophylactic is hotly debated, partly because of the side-effects. But, in October 2015, a new trial got underway in the UK: it is the world’s biggest clinical trial to date to investigate whether aspirin really can prevent bowel, breast, prostate, stomach and oesophageal cancer returning in people who have been successfully treated. If successful, it will determine whether for this group, at least, the benefits outweigh the risks. Exactly how aspirin may reduce cancer risk isn’t clear. But, says Young Kim, who researches in the division of cancer prevention at the US National Cancer Institute, “chronic – not acute – inflammation plays a critical role in accelerating cancer development”. Research suggests that chronic inflammation plays a key role in colon, prostate, pancreas, breast and lung cancers, she says. The main mechanism is the inflammatory process itself, she explains: inflammatory chemicals cause cells in the membranes of these organs to become unstable and susceptible to the kinds of changes that can ultimately lead to cancer. Aspirin can reduce the production of some of these chemicals. But so, Kim argues, can certain foods, and foods generally don’t carry side-effects. “Vegetables and fruits are great sources of natural anti-inflammatory components that maintain health and prevent serious diseases like cancer,” she says. In a review of research into whether certain nutrients, such as omega-3 fatty acids, might modify chronic inflammation and so influence cancer risk, Kim and her colleagues concluded that more work is needed but “the societal benefits of using foods and their components to prevent chronic inflammation and associated complications, including cancer, are enormous”. A huge range of other diseases are also now being linked to chronic inflammation, including brain-related conditions such as Alzheimer’s disease and depression. Still, it’s not clear to what extent inflammation actually drives these diseases, argues Alberto Ascherio, professor of epidemiology and nutrition at the Harvard School of Public Health. With depression, for example, in work that he was involved with, “the data points in the direction that [a low-inflammation] diet does help to reduce the risk of depression, but I don’t think it’s definitive”. With Alzheimer’s, meanwhile, although there’s research suggesting ibuprofen might help, he says there’s also research finding that another type of anti-inflammatory can make symptoms worse. Given that, it’s not clear how a daily aspirin would affect the overall long-term health of someone at no particularly raised risk of such diseases. But as more large clinical trials produce results, we will start to learn who could really benefit. This story is part of the Eat to Treat series by the UK’s Mosaic project.